Canter – that word that strikes fear in the hearts of some riders. Canter can instill all the breath holding reactions that you have worked so hard to overcome at walk and trot. As soon as you are ready to canter you feel your body start to tense. Perhaps you have difficulty getting the right lead or a clean flying change. Whatever the issue, a lot of the problems can be helped by cantering on the ground first without your horse. Remember when you were a child and you imagined you were a horse? You would spend the day trotting and cantering around while recreating the horses movements. Well if you never did this as a child it could explain why you might have some difficulty as an adult with your riding. Even if you did this as a kid, years of sitting in the car or at a desk may have created some unwanted stiffness that effect your canter. So let me suggest you allow yourself to return to your childhood for a moment. When it comes time to canter I sometimes ask students to canter on the ground without their horse first. Almost all the mounted problems will show up when they canter solo whether that is simply cantering straight or doing flying changes. I have found a certain percentage of students that could not canter at all. No wonder their horse has difficulty! When you are by yourself you might want to check out your canter. I suggest you do this where no one can see you. Canter around on both leads. If you have trouble cantering, see if you can skip. Skipping is the same as a flying change of leads every stride. If you can’t skip, I strongly suggest you find a child to help you learn how. Watch them for awhile and see if you can imitate the movment. Once you have checked out skipping, gradually increase the number of strides you remain on the same leg and you will be cantering in no time! Next look at quality of your canter. If possible have a mirror in front of you so that you observe yourself. You could also set up a video camera for filming. Set the camera up on a tripod and let it run as you experiment. Afterwards watch the tape and decide if you are a “good mover” or a “bad mover”. Ask yourself the following questions: What is the quality of your canter like? Do you prefer one lead? Is it the same one your horse prefers? Do you throw your hips sideways or do they stay straight as you canter? If you twist then you are using your torso and pelvis to canter rather than your hip joints. This will make the horse travel crooked. Do you lead with your shoulder? Does your horse lead with the same shoulder? How difficult is it for you to change leads? Does your “hind leg” not want to support you on your “bad” lead? Do you wind up falling forward on the forehand? Do you drag your back foot? If you were to collect your canter (you could go all the way to canter in place) do you lose all rhythm and suspension? If you were to lengthen your canter, do you wind up getting fast instead of increasing the stride length? What happens when you try to do a flying change? Notice how much effort it takes to canter and think for a moment about your horse. Not only does he have to carry himself in canter; he has to deal with your weight on his back. When you are out of balance it makes it much harder for him to move balanced and straight. You might find that you appreciate your horse a bit more after you have cantered around for 5 minutes! So now that you have found out what you canter is like, the next question is what you can do to improve it? 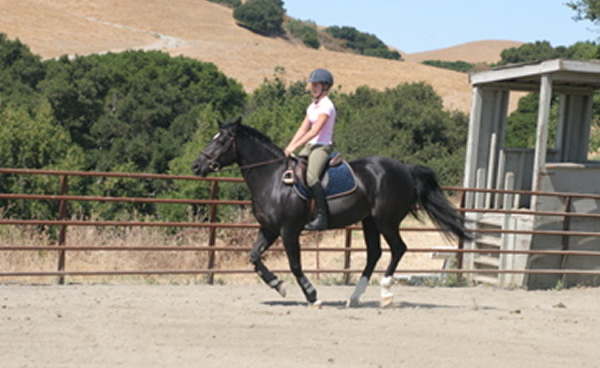 The easiest method I have found to improve canter on the ground is to place both hands on the thigh of the leading leg. So, if you were to canter on your right lead, you would place your hands on your right thigh. Start by standing in place and tapping your right foot on the ground pushing the thigh down with your hands and having the leg spring back up again. Notice that you have to support yourself on the “hind” leg. Let the joints of the hip, knee and ankle of the “hind” leg fold a little, rather than locking the leg straight. This is the same thing the horse needs to do in order to collect or do a correct down transition from canter. The horse needs to sink down into the joints a little in order to absorb the movement and support the weight to stop from behind rather than stiffing the joints, falling or pushing himself forward and braking on the forehand. By standing on one leg and absorbing into the joints, you simulate the balance required for the horse to canter in balance. After tapping your lead foot a few times without losing your balance, canter off continuing to send the leading leg to the ground with your hands and letting it rebound back to you. Feel the suspension of your stride increase as you spring the leading leg up into your hands. Notice that by having your hands on your leading leg you are less likely to twist your shoulders and torso when you canter. Instead you will be flexing at the hip when you canter, allowing that joint to open and close with each stride. Change leads and canter on the other leg. Notice if the back leg becomes fatigued when you canter on your “bad” lead. Stop for a moment and repeat the tapping exercise standing on the weaker leg allowing it to find a position where it feels supportive, then canter forward again. As a test, see if you can “freeze frame” the canter by stopping on your hind leg without putting your lead leg on the ground. Do you want to fall forward or sideways when you attempt this? Does your stifle (knee) want to wobble? Then canter on again. This exercise is a long half-halt in canter. Notice how the rhythm of your canter has improved and that you can slow the canter down effortlessly by sustaining the support phase on the hind leg. See if you can decrease your stride length so that you wind up cantering in place without losing the suspension or the rhythm. Then canter forward again. Often, when people attempt to slow the canter down, mounted or unmounted, they interrupt the flow of the canter and brace. When you do this exercise correctly on the ground there will be no loss of balance, rhythm or flow. Now you will be able to decrease your canter speed and stride length or increase it. When you increase your stride, remember that you have to push longer from the hind leg sending the body forward. When you collect your stride you push vertically with the hind leg lifting the body upwards and absorbe more deeply with the hind leg. Once your canter has improved with your hands on your thighs pretend to hold the reins. See if you can maintain the same amount of suspension, rhythm and balance as you canter circles, turns and transitions from trot to canter. Notice whether you are leaning in or out. Sometimes it helps to purposefully do the wrong thing to contrast it with the right thing. So go ahead and do “bad” canters, turns and transitions. Then make the necessary changes to improve the canter. For your canter transitions, experiment with leaning forward for the canter transition vs. staying upright. When you lean forward cantering it makes you very heavy on the forehand and difficult to get into the canter motion. After you have experimented with a little of this go for a ride and see what happens. When you canter remember the feeling you had while cantering on the ground. Allow your legs to do the motion while the upper body remains quiet. Let the horse do the cantering while you follow the motion. If you want to slow the canter down, remember how you did it on the ground. You had to keep the motion and rhythm of the canter going in your legs and seat while decreasing the speed. Finally, for transitions, remember how you had to allow your hind leg to absorb the motion. When mounted make sure you can sink into your hips. Think about how you could “freeze frame” your canter on the hind leg. Your horse needs to be able to do the same thing in order to slow down or halt. Remind yourself that it is the hips, knees and ankles that open in close in canter so that you can look effortless with your upper body. If you find that you get stuck, recreate the feeling on the ground and find out what your body has to do to correct it. This will save your horse from a lot of unnecessary pounding on his back and help you have more choices when you are in the saddle. Copyright© 1999. All rights reserved.